In our SXSW preview, we told you about an intriguing fan-made movie called 100 Bands in 100 Days. I saw the film while we were in Austin during its world debut and it made me laugh, nearly moved me to tears and inspired me to look at live music in a new way. 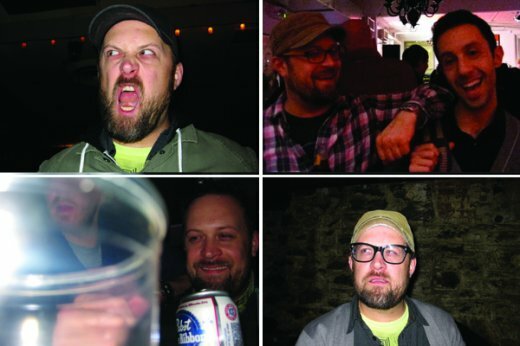 And as we share more of our coverage of SXSW 2011, I’m excited to share with you an interview with director and the fan who created the film Nick Sonderup who went on an amazing live music adventure. As I mentioned in our SXSW preview, it’s certainly a film that reminds me of the fans who challenged themselves to see 50 bands in 31 days back in October. So a few days after SXSW, I caught up with Nick and asked him to tell us more about 100 Bands in 100 Days. And here’s my email chat with Nick as he takes us deeper in to his thoughts, feelings and inspirations for his epic live music adventure. LF: In your final “What I Learned” post, you mentioned the importance of community in live music. Many times at concerts, fans don’t have the chance to talk or truly swap stories at the show. In your experience what did you learn about the power of live music as a not only a place of escape but also a place of refuge and self-discovery among and with other live music fans. Any specific stories you can share about connections you made with fellow fans? NS: Initially I saw the “community” as the bands and musicians I was seeing. I felt a little closer and more in tune with them then with others at the show because I was out there every night, much like they were. Then, on a personal level, I felt like those who were interested in the 100 bands project helped create a community, too. A community of people who were either attending shows with me, cheering me on, encouraging me via email, or generally into what I was doing. I would often receive random emails from strangers who liked the project, and wanted to tell me how important music was to them. I think they felt a kinship with me and in what I was doing. I remember one email from a telling me how music is basically the one thing keeping him alive. That’s pretty powerful. I mean, how do you react to that? I was just trying to pursue a passion project, and people pouring their hearts out to me. That reassured me that what I was doing was a good idea, and that it mattered in some way. As the project got bigger, I wasn’t just doing it for me anymore, but also for the community that had developed. During the movie, I was really moved by the part about your Grandma, because last year, for me live music helped me to cope with my dad’s death in August. In what ways did live music help you deal with the grief and other emotions you were dealing with during your 100 days adventure? What would you say to other fans who might not realize how powerful a place of refuge, community and self-discovery live music can be? I think it probably helped because I had to keep going and had a purpose – to finish the project. I remember texting with my sister pretty much non-stop that night, while at a show (Great Lake Swimmers at Bowery). So, the music was helpful, but to be honest, on that night that she passed away, I wasn’t totally “there” – even if I was. I think when you’re doing something like 100 bands, or another personal passion project you’re throwing yourself into, the momentum and purpose becomes the reason and the refuge. It’s something that keeps you going and keeps you focused, but also allows you to retract at anytime and think, “This is mine” and insulate yourself, if you need to. Were there other concert fan challenges that inspired you to make the film? Other concert documentaries that influenced the storytelling and direction? When I told people what I was doing, some people would try to compare it to Super Size Me and ask if I was trying to be the next Morgan Spurluck, but of music. I would laugh, but understood the comparison. But he was trying to prove a larger point about society and health. I was just trying to prove a point to myself. Even if I didn’t realize what that point was at the time. I didn’t think I would make a film during the 100 days, so there wasn’t any real inspiration in that respect. Unlike some other documentaries, we were making this after the fact, so we knew what the story was. But it was still a challenge to put it all together and hit the right length that told the story, and didn’t drag. I wrote up a loose outline of how I saw it all playing out, and then our editor Dave Madden did a really great job taking that, with the footage, and telling a compelling story. I really enjoyed the movie and I wished it was a bit longer. If could expound on certain points or specific moments, which ones would you choose and why? Will you be making a second film or embarking on a new challenge? We really feel like the film is just the perfect length to tell the story. First, there simply wasn’t a ton more footage to use, and we didn’t want to get into the world of recreating. We used what I filmed during the 100 days, and the talking head footage we filmed after. And we feel like it tells the story really well. I think if I had started the project with the intention of making a documentary film about it, we might’ve been able to it longer, possibly even a feature. But as it stood, we felt good about the length and its ability to tell the story. When we first started talking about the idea of doing a film, I pulled out a few key milestones from the 100 days, those that seemed most poignant in telling the story, and we built the arc based on those. These became the plot points in the film. As far as new projects go, I’m in the beginning stages of a new music-based documentary at the moment. We have a band that’s interested, an idea of what we want to do and say, and will hopefully get going very soon. It’s nothing I can talk about at the moment, except to say it’s not 200 bands in 200 days. Thankfully. You mentioned you were having a “pre-midlife crisis” that led you to embark on the challenge. In what ways were you most surprised about the physical, emotional and relational impact of the adventure on your life? What did you learn the most about yourself that you didn’t know before the challenge? I think the thing that surprised me the most about the project in general was the attention. I say that because I never started the project with the goal of garnering any attention, or self-promotion, or with some bigger goal like that. I really just wanted to do this for me, to reconnect with music, and I think that’s what brought the attention in the end. When people saw that it was a pure idea, a personal passion project, that’s what people recognized and liked about it. That and the fact that there was a determined amount of time (100 days), so you knew there would be an end, and it was exciting to watch and see how it all unfolded. The biggest thing I learned is that if you do something for yourself that you want to do because you’re passionate about it, and you throw yourself into it, people will recognize and respect that, and support you in any way they can. That’s ultimately what drew anyone who wanted to be a part of it. Whether that was my friends who went to shows with me, people who donated money, or the strangers who did what they could to get me into shows, on guest lists, send me contacts, and so on. Not to mention why my partners in the film got involved – Francis (from Shout it out loud music) and Al (ARMM). I think the purity (and insanity) of the project is what got all of these people excited about it. I also learned that too much pizza and beer is bad for your health. I’ve seen other fans put themselves to the test with similar concert challenges. You had very specific rules as to what a show was and how long you had to stay at a show for it to count. Why did you make those rules and how did those rules help make the adventure more focused, meaningful and unique? I made the rules because I wanted it to feel legit and impressive in some way – and it gave me a structure. As a creative person, I still need rules to work within to provide context and help make it a good idea. That way, I couldn’t ever be accused of trying to get away with something. And since the rules were very simple, clear, and posted for everyone to see, everyone knew what I had to do (including myself). Well, my band never toured. Actually, we never even left our rehearsal room for two years, so in some way, this project was probably a reaction to that falling apart. At the time, it was upsetting that the band just fizzled out, but in the end it was bound to happen. Looking back, it was no coincidence that the 100 bands journey was beginning right as that project was ending. It gave me perspective on touring for sure, because in some way, I felt like I was on tour during it – even when I was just in New York. But especially because I wound up seeing music in NYC, New Jersey, Hartford, Minneapolis, Portland, London and Paris. The “5th Wren” experience was unlike anything I’d ever imagined could happen, during the 100 days or in life. It’s the dream of anyone in a band (or a fan) – to be on stage, in front of a sold out crowd on a Friday night in New York. And to have that chance with a band like the Wrens, local heroes who are still doing it after all these years, that was like nothing I will ever experience again. I remember thinking after I jumped down off stage afterwards, how I wanted to get immediately back up there. It was truly exhilarating. Was there ever a point where you felt sick of the challenge and began to despise live music because of the physical and psychological exhaustion? How did you deal with the moments when you “hit the wall” in your live music marathon? I had a few of these moments when I was tired of going out every day. It was usually on a Sunday or Monday when I just wanted to stay home and watch TV. Which is why I hit up a jazz show over brunch a couple times, or afternoon acoustic show, but those were few and far between. I didn’t want to make that a habit. When I hit the wall, I just remembered that people knew I was doing this, and I couldn’t stop. I also kept reminding myself why I was doing it, and what was special about it, and that was usually enough to keep me going. I also tried to talk to as many of the bands/musicians as I could. Telling them what I was doing was further motivation, and fuel to keep me going. One of your reasons for doing the challenge was to reignite your love for writing about live music. How did the adventure give you a better perspective on chronicling, questioning, examining and celebrating your concert experiences with the written word? I started the project thinking it could be a way to get back into writing about music, but didn’t really end up that way, which is fine. I certainly have strong opinions when it comes to music, and I’m never afraid to share. But as the project progressed, it became less about the music and more about the feat of going out and seeing music every day. That was just more interesting, not only for me, but for anyone reading. More people seemed to want to know what it was like to do the project, not necessarily a detailed account of this band or that band. How does this challenge rank in relation to your other most memorable live music experiences? Before the 100 days, even if I did see a lot of shows, I never felt as connected to the music, and the live performance of it as I did during this project. I have a lot of fond memories going to great rock shows, but after the 100 days, those now felt more like “concerts.” The distinction being that I felt more like an observer, and the performer felt like this untouchable thing up on stage. But 100 bands definitely broke down that wall and humanized the live music experience a lot. I felt like I was more in tune with the musician and what they were doing, because I was out there every night, too. So, it’s impossible for any other single music experience to top the 100 bands experience as a whole. While there were certain nights that rank up there within my all time best shows (Public Enemy, The Wrens), the experience as a whole is unmatched, and probably always will be. Are there plans to make the film available for other fans to watch and buy the film? Unfortunately that’s still TBD at the moment. We have some things we still need to figure out before releasing it publicly. But we continue to submit, and get invited to submit, to film festivals, and may even have an option for some TV exposure. However it gets out there, we’re excited that more people will be able to see it and that we’ll be able to continue to give the film and project life. If you could do the challenge again what would you do differently? What would you tell other live music fans who are considering the same challenge? Looking back, if I were to do it again, I would be more thorough and plan more of the project out in advance. As it happened, I was figuring it out as I went along, hence the “daily picture” starting on day 28. I also would’ve filmed myself the entire time, and tried to create the film about the project from the beginning, rather than afterwards. But hey, it still worked out. I would’ve also probably treated myself better and not drank as often or as much, even though that did add to insanity of it. That would be my biggest piece of advice for anyone who might be considering a music marathon: Eat well. Drink less. That and wear earplugs, every show. People often ask me if I am going to do it again, or whether I would recommend anyone else do something like this. The answer is usually “hell no” – for dramatic and comic timing. But the truth is, while I’m not suggesting anyone go out and do this exact thing. I do encourage people to go out and do something just for themselves – to pursue something they’re passionate about, and as long as it’s true and pure, and it will be worth it. It doesn’t matter if it gains attention or not. An idea doesn’t need to gain attention to be validated as good. It just needs to be true, and usually when it is, it will then get the attention it deserves. My hope is that the film motivates people to go out and do that thing they have been meaning to do, but haven’t followed through with. Because odds are if you do, you will not regret it, no matter what the outcome. Thanks again to Nick for sharing the story of his 100 Bands in 100 Days experience. If you have a question for him or want to share your own concert challenge story, please post it in the comments below. This exploration is yet another fantastic chapter in our ongoing series of Live Fix experiments. You can check out more Live Fix concert fan stories here. And stay tuned as we continue to explore more concert adventures like Nick’s “100 Bands” Challenge, and more of the emotions, psychology and sociology of the live music experience!